These filling and satisfying Vegan Sweet Potato Black Bean Enchiladas are packed with bold Mexican flavors. You’d never guess they were vegan! Sweet potatoes are my SPIRIT ANIMAL. How are they so very ordinary and extraordinary at the same time. That is the question. I don’t like question marks. But seriously. The humble sweet potato. An innocent root veg that’s secretly but not so secretly packed with oodles of vitamin A and antioxidants and fiber and phytonutrients galore! I simply cannot. I cannot get enough of the orange glory superbness. 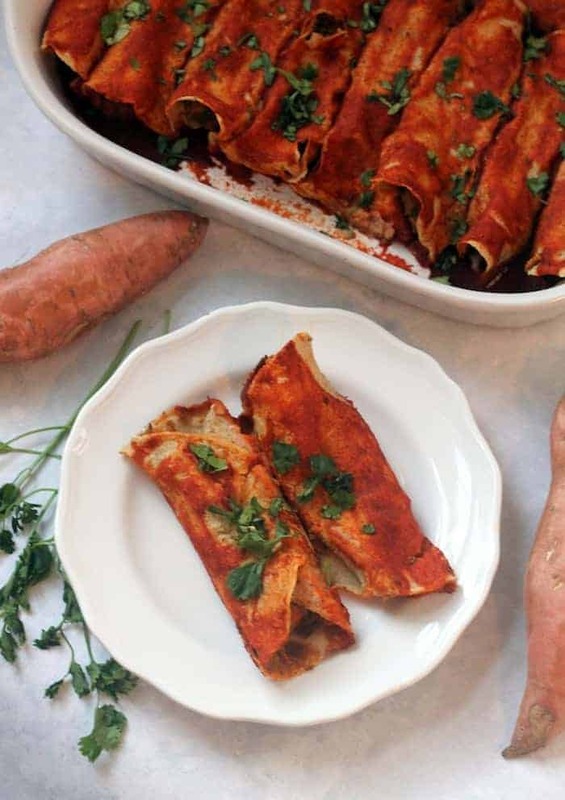 While I adore my sweet potatoes roasted whole or sliced up and dipped in buckets of hummus, I also adore them stuffed into enchiladas. Believe me when I declare wholeheartedly that these vegan enchiladas are literally my favorite meal ever. I douse them in every scrumptious condiment known to woman, from hot sauce and salsa to hummus and guacamole. I mean it’s so good it should be illegal. And let me let you in on a little secret. This recipe is super forgiving. Use whatever bean or legume you fancy. Leave out the kale or sub spinach. Add whatever spices sound delicious at the moment. As long as you have your tortillas, salsa, cashews, beans, and pepper (that adds necessary moisture), you’re golden. Enchiladas are my spirit meal. Soooo it comes as no surprise that adding sweet potatoes to my favorite recipe makes them even more of a present for your buds of taste. I’m so excited for you to lay mouth on these splendid spud-filled ‘ladas. If you need to prep your sweet potato, pierce with fork and bake at 400F for one hour or until soft. Meanwhile, soak cashews in warm water. Preheat oven to 350F. Drain cashews. Combine cashews, salsa, and pepper in a blender (I used a nutribullet) or large food processor and blend for about a minute, or until smooth and creamy. Add in beans, salt, cumin and cayenne. Process until mixture is fairly smooth. Add in the torn kale and process just until the kale is broken down. Dump mixture into a bowl. Stir in sweet potato and nutritional yeast. Using a 13×9 pan, pour just enough enchilada sauce to cover the bottom. Spoon filling into tortillas, fold them up, and place seam-side down on the pan. If the tortillas break, that’s ok. You may want to heat them for 15 seconds in the microwave. Once all enchiladas are all next to each other in the pan, cover them liberally with the rest of the enchilada sauce. Bake for 30 minutes. Serve with avocado and extra salsa. I’m so game for these vegan enchos, I can barely contain my face salivation! Loving the idea of a versatile/forgiving recipe forever and always, and I’m so down for these squeaky clean, healthy yet comforting spirit animal ‘ladas. Bring on dat whole batch! 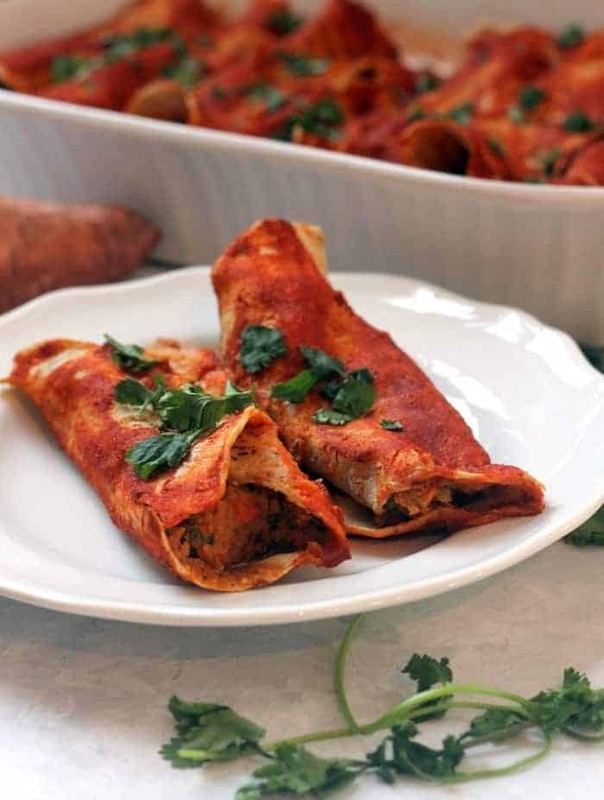 You have the best enchilada recipes- these are no exception! I just bought a huge supply of sweet potatoes so now I have lots of great inspiration! Oh my goodness!!! This looks absolutely amazing!!! Thank you so much for sharing! Enchiladas are my spirit meal too. Add sweet potatoes and I’m in heaven! I want to lay mouth on every single one and keep them all to myself, muahaha! Love, I thought onions were your spirit animal. Ummm rice krispie treats with Depot peanut butter. Get it right get it tight. Confession: I’ve never eaten enchiladas before :shock: I know. Can I come over for dinner??!? NO way!!!! Ummm see you in t minus five minutes byeeeeee. Are we only using the flesh of the sweet potato and not the insides? Or are we using the entire potato and if so when is it added? Hey Carly! Just the flesh of one small sweet potato and you’ll stir it in with step 3. I’ve been on a serious Hummusapien recipe kick lately and nothing has let me down yet! 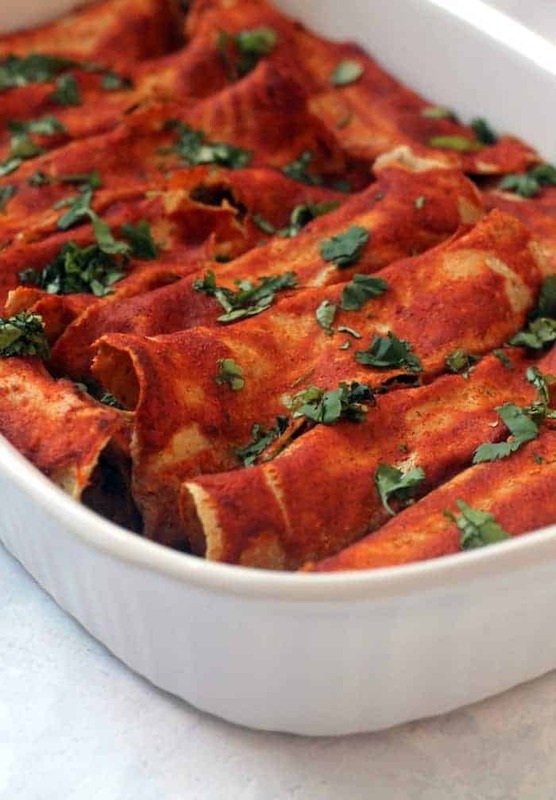 Everything has been so tasty and easy but these enchiladas are my favorite so far! Seriously SO GOOD! Sure haven’t… but that will be next on my list. thanks! What would you substitute for the cashews? I am allergic to them. The cashews add creaminess, you could try avocado or hummus! Made these last night and loved it!! The filling is to die for! I think the boyfriend had 5 haha. Will def be making again! Hi. These look pretty good. What about nutritional info (including serving size) to go along w/ the recipe? Made this recipe for the second time tonight- it is so amazing! I make a few adjustments based on what I like and added daiya cheese before baking. Though I’m vegan, my boyfriend is not and even he loves these. Love those additions! So glad you enjoyed them.